@Capdema is set on releasing a ‘white-paper’ of sorts, a Budget proposal for the next decade if you will. This project, with which I was closely associated, provides the blueprints for fiscal consolidation, as well as a set of bold policy proposals on both sides of the balance sheet. An acquaintance reviewed the document, and one of the many observations they have made caught my attention: the Budget proposal basically takes the side of fiscal consolidation (austerity, if you will) as a sort of ‘There is No Alternative’ policy decision. Maybe it is; Perhaps some mechanisms embedded in the proposal seemed too harsh and too controversial for an otherwise consensus-seeking mindset in Morocco, prevalent among policy-makers and pundits alike. But then again, this is the beauty of policy-making: choices are made depending on ideologies, or perhaps, according to each one’s Weltschauung. A traditional left-winger in Morocco (including the vast majority of my own PSU) though it makes sense to get value for money from government expenditure, would find it hard to support policies designed to contain the size and cost of the civil service payroll. They would cheer the introduction of a de facto wealth tax on the rich, yet express scepticism to the idea of tax cuts to corporations. Strangely enough, the voices of pro-fiscal consolidation in Morocco are very far and between, and I mean, voices that advocate specifics in terms of deficit and debt reduction for instance. I would like to discuss two aspects of that fiscal consolidation government and pundits alike want to see happening, yet fail to make it happen in terms of government policies: Subsidies and Tax exemptions. Ceteris Paribus, the Compensation Fund accounted for less than a third of the Budget Deficit in 1979-2007, but then since 2008, it has been on par. The Compensation Fund has long been a pain in the neck: it is inefficient, it showers the richest households and big corporations with government subsidies, and a small fraction of these actually reach the targeted populations (let us put these at the conservative estimate of the bottom 20% income households) But for the past 30 years (say between 1980 and 2007) the aggregate crowding-out effect of this fund has been relatively low compared to GDP – less than 1.61% of GDP, yet for the past 4 years, the system has proven to be unsustainable; the current narrative about the ‘Compensation Problem’ shifts the blame to international markets and the upward pressure on commodities’ prices. Actually, the increased reliance on domestic consumption to sustain growth over the past 5 years means richer households would consume more of these subsidized goods, hence putting pressure on the compensation fund to require more funding from the Budget. Tax exemptions in themselves cost about as much as the Budget deficit – about 33 Bn in 2012, but they stir government policies in the targeted sectors for different tax credits, exemptions and moratoriums. But, it is quite difficult to argue a reasonable case for some of these, unless political calculations are considered as well. The agricultural sector is pampered beyond reason (there are tax exemptions as well as direct subsidies) with official talking points arguing the very existence of the generous moratorium is of social value. It is as though the 120-odd Bn dirhams are evenly distributed among Moroccan farmers, when it really is not, and the figure speak for it. But I digress. The central question remains: do we go for Stimulus or Fiscal Consolidation? As a matter of fact, the two options are not mutually exclusive: a fiscal reform can be nested in an ambitious spending program, but for policy evaluation purposes the picture is blurred a bit. Yet let us consider the Stimulus option as fairly as possible. The bottom line is simple enough to make it government policy: push output growth as close as possible to 6.5% for a short period of time. But that’s about it: it is the very nature of a stimulus package to be short-lived – or perhaps the lefty punditocracy is referring to the Welfare State? How would one go for a Stimulus in Morocco? We are already spending good money in public investments (Budget and State-managed companies put in 188Bn in investments for 2012) so perhaps we might consider some scheme to boost consumption; the Compensation Fund is already taking care of it, but not as efficiently as one might have hoped it to be, so a reform has to be included into the stimulus. The tricky part is to get other policy measures alongside the Compensation Reform, because it will harm growth and household consumption, and the latest HCP figures on that matter provide evidence to that effect. As for massive recruitment in the civil service, it will not do good, especially when the new civil service labour force is ill-suited to their selected job: is it enough to get more teachers and nurses, when quality is in higher demand? So tax cuts are the way to go, specifically on distortionary taxes, like VAT and/or Income tax, which means there are 81Bn to be cut, with perhaps a targeted 31Bn worth of various taxes and duties on imports; on the other side of the balance sheet, potentially 50Bn, the Compensation Fund have to be cut one way or the other. Let us suppose this tax cuts-based stimulus wants to go back to direct fiscal pressure observed in the early 1990s, which means there are 2.07% worth of tax cuts to be enacted, 17Bn that is. This means 2,554dhs worth of tax cuts on average to Moroccan households, and that contributes a full percentage point to output in 2012, close to 4% GDP. The remaining .8% (to get to potential output) can be scrapped somewhere, surely, but it cannot go beyond 2014. Unfortunately, I cannot go on about what a Stimulus-based budget policy can do, but it seems to me the exogenous factors from Morocco’s commercial partners are best matched with structural reforms, and these are better served in an austerity-based government program. suite du post précédent, comparaison des caractéristiques des groupes parlementaires entre 2007 et 2011 en utilisant l’analyse de composantes principales. Les résultats démontrent une cohérence entre les hypothèses évoquées plus tôt sur les déterminants du populisme, et permettent aussi une détermination des ‘types’ de groupes parlementaires. Well, that was about the democratic/radical left. The strange thing however (though it is no surprise, given the intellectual leadership controlling PAM caucus and party structures) is how fractured the ‘left-wing caucus’ -if there ever was: PPS caucus, the second-largest sub-caucus after USFP has been so diluted in its membership -as far as the selected parameters are concerned- it is the farthest on the map; ideology, populism as well as parliamentary leadership (neither Ismail Alaoui nor Nabil Benabdellah have succeeded in their respective bids for a seat in 2011 and 2007) so I should perhaps stop considering PPS to be anything near a nature fit in the grand ‘left-wing coalition’ (I was warned to that, but hey, I am a faithful follower of Saint Thomas) so we are left with PT (Benâtik) and PGVM (Fares-Zaidi) in parliament. 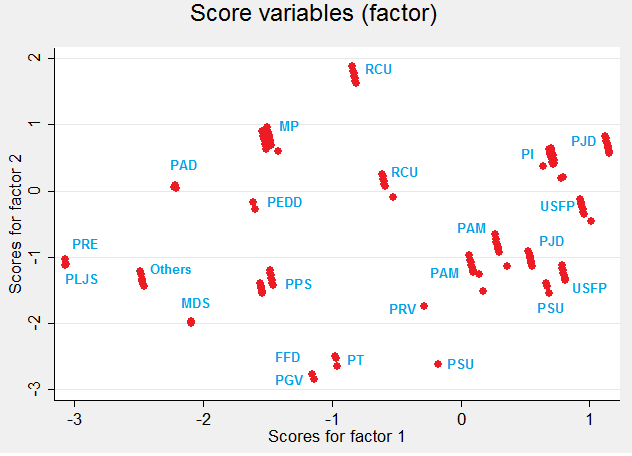 RNI-UC does not seem to be such a great fit after all; I had to make do with the available information (the parliament website displayed only caucuses on the database for the 2007 parliament) but then again, the score plot does not seem to splint them apart: most of these are grouped into two sub-groups, the closer one to PAM and others being made up mainly of RNI members, and perhaps those sympathetic to a strong alliance with the said party. (RCU stands for Rassemblement Constitutionnel Unifié, RNI and UC caucus together, though I cannot say if UC used to back up the government when their RNI bretheren were part of it) On the other hand, there is also the effect of RNI going over to the opposition after 2011; this in fact is the main determinant with the RCU cloud is split. At least 5 groups can encompass 2007-2011 caucuses. 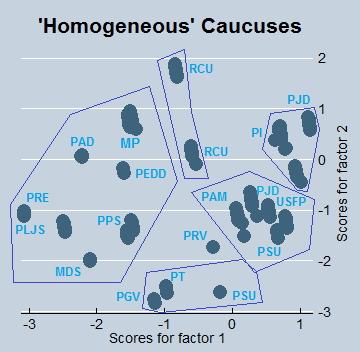 USFP and PJD’s caucuses ‘splintering’ is partly due to the same effect observed for RCU (their respective government/opposition swap between 2007 and 2011) and partly due to the more heterogeneous nature of their respective caucuses. From what I have heard (of reliable sources) party discipline is very stern in parliamentary proceedings – i.e. members are expected to vote the way their leadership wants, and pressure is eventually exerted when needed, especially for majority members. Yet USFP and PJD members (after they got into office) regularly challenge their leadership; if additional data about the voting record of each member were made available, the same analysis can be conducted to produce more finessed results. In the finally analysis, it is possible to group caucuses between 2007 and 2011 into 5 large super-groups, the distances between each points providing a measure of distance according to the selected parameters. This shows for instance a PAM-USFP alliance is not that stupid nor treacherous, and even a second PAM takeover on PSU is plausible enough. Le blogpost s’attache à présenter une évaluation quantitative des déterminants du populisme dans la description de l’idéal-type du leader politique, en utilisant des données sur une population de 599 membres du parlement (chambre des représentants) élus entre 2007 et 2011 sur les listes locales parmi les 295, puis 305 sièges sur les 92 circonscriptions électorales ouvertes. Il en résulte que trois principaux déterminants conditionnent la réussite du ‘Leader Populiste’: parlementaire reconnu, ayant une forte identité idéologique et un engagement syndical important. On s’intéresse ensuite à une description plus détaillée du type de leadership populiste par groupe parlementaire. Enfin, il semblerait aussi que le genre ne soit pas si discriminant qu’on peut supposer, ce qui implique la possibilité de voir émerger une génération de politiciennes sans complexe vis-à-vis de l’utilisation du discours populiste. Populism in Morocco is a strong word, difficult to define, precisely because it takes so many forms in the speeches and policy announcements, all across the political spectrum. The common denominator remains the claim a populist leader makes, namely the ongoing struggle between the ‘people’ and the ‘elite’ needs strong leadership, and they (usually a he) can deliver against the effete elite: depending on the politician’s favourite target, it ranges from French-speaking high officials and upper classes (a fifth column of sorts), secularists, to big business, and finally, the Makhzen almighty. 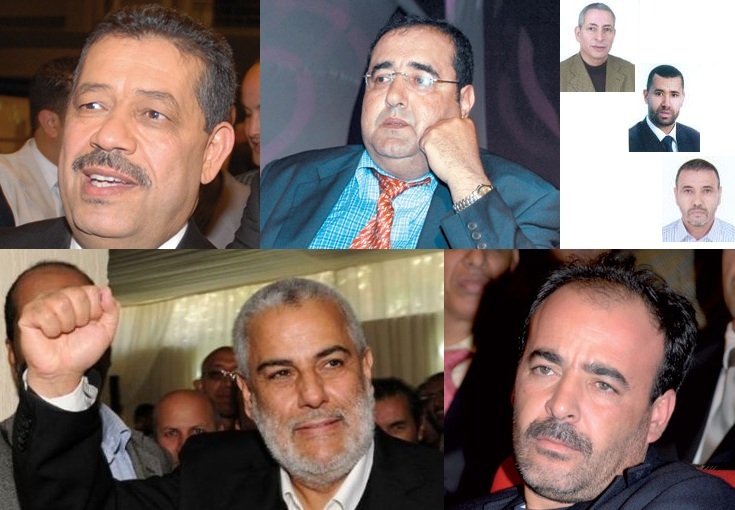 As far as the content of this post goes, these differences are of no particular importance: while it is generally quite important to define the sort of populism one talks about, it seems there is good evidence to support the claim that a standardized narrative can be fitted in the Moroccan political discourse, to state that populism among our politicians is driven by three main components: Ideology, Union ties and Parliamentary leadership. These figures are the results of computations (mainly probit estimates) computed over 599 representatives elected between 2007 and 2011 on local ballots over 92 districts. * Ideology: this is not just about each politician’s favoured talking points, although as far as the PJD leadership goes, religious invocations are used more often than not. Ideology, as I defined it in this little problem, has to do with the words used by the potential ‘populist’ politician as well as their party, mainly in their respective electoral manifestos. It may come as a surprise, but the PSU electoral manifesto of 2007 was full of left-wing populist rhetoric. On the other hand, a relatively big party, the Mouvement Populaire, refrains from any populist rhetoric, contrary to another big, ‘administrative’ party, Authenticité Modernité. A populist leader is 1.5 more likely to adopt stronger, more ideological talking points than the others. Abdelilah Benkirane fits perfectly in that respect. * Union ties: This is particularly true for USFP (CDT-FDT) and Istiqlal (UGTM), but less so about PJD (UNTM) for large parties, which makes sense, since the rules of engagements in union politics require some measure of verbal violence and other tactics from the dark side of politics. In fact, a populist leader is twice as much likely to have union ties, or be a union leader himself, compared to other politicians. This is why perhaps Hamid Chabat holds so strongly during the current Istiqlal leadership bid. What about other determinants? Interestingly enough, a populist leader is very unlikely to be female, which is tough enough for Nabila Mounib (who is neither a parliamentary representative nor has succeeded in her previous bids for office in the 1990s) but still, the estimates are very shaky, which means gender is not that important a determinant. In essence, it means that being a woman clashes with the populist mantra, but that should not prevent the rise of a new generation of populist female politicians, perhaps formerly of the radical feminist organizations. Out of the 599 representatives in the sample though, there are only 7 women out there, which tends to weaken the interpretation in that respect. Finally, there are other unobserved variables that might condition populist discourse not capture by the model below, although these account for only 25% of the results, which is encouraging for such uncharted territories. 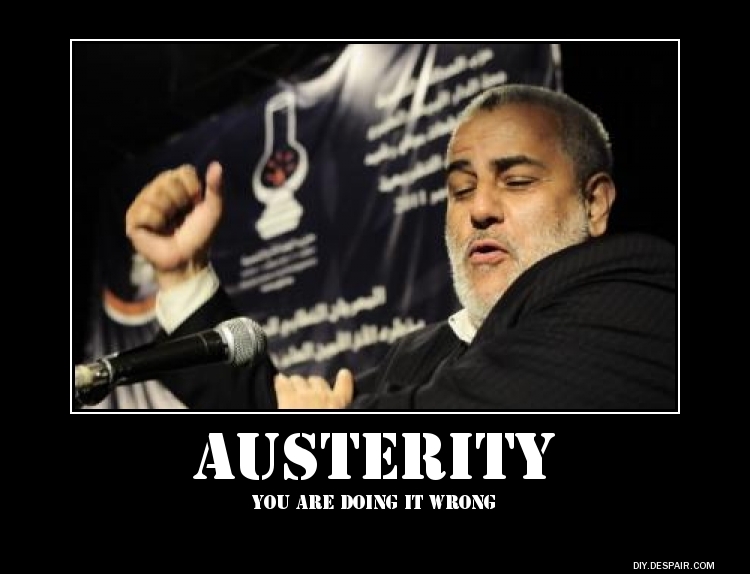 And Morocco has been -and continues to be- a Keynesian-style economy. Unfortunately, it indulges a lot more into Zombie Keynesianism, fiscal and expenditure policies are indeed supposedly designed to stimulate domestic demand, but they do not reach the majority of our citizens (just think of household consumption distribution in Morocco: a third of its aggregate total is controlled by 10% richest households) the same can be said of public investment, although the argument is not as clear-cut as one might think it is. Look at the graph: deficit as a percentage of GDP opposite GDP growth over the period 1960-2011. correlation seems strong enough to sustain the assumption deficits are there to alleviate deficit. However, beware of confusing correlation with causality; we can also produce equally good evidence that deficits are the ones responsible for GDP volatility. 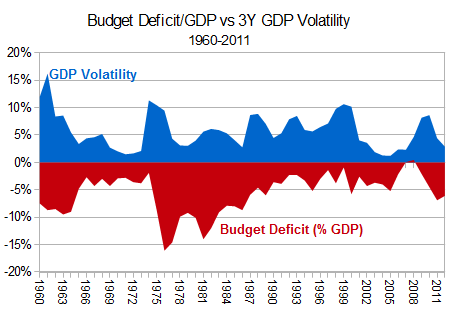 There is also the question of how much historical volatility is linked to deficits. The choice of 3-years deviation of GDP growth was purely arbitrary, and if anything, the strongest correlation between deficit and volatility in GDP is observed for 6-years periods, and immediate correlation between GDP growth (as it is) and deficit in percentage of GDP is equally significant. Finally, there is relatively weak evidence deficits limit somehow fluctuations in the economy (less than two years). This result seem to be in line with usual assumptions in taking 5-years averages to smooth things over. We therefore have a glimpse to the double effect of deficits: in the shorter run as well as the longer run, deficits are negatively correlated to GDP volatility and growth. Why do we care about standard deviation in GDP growth? For many reasons, chiefly because of government targets and growth itself; large deviation in GDP from one year to the other reflects badly on average growth – think about the 5.5% average growth projected for 2012-2016 and the impact of large ups-and-downs in GDP growth; as it stands, 2014-2016 needs to deliver consecutive growth figures close to 6.75% each year. Second, volatility in growth means higher uncertainty. Last year, Morocco created in 2008 some 72.6Bn dirhams worth of goods and services. But the next year, only 43Bn where created, and the next years after, an average of 36Bn. These differences in expected additional GDP – about 30 Bn from one year to the other that could have benefited to many businesses and individuals, but did not, because GDP growth fluctuated a lot (not as much as the 10-year average). This paper examines the relation between fiscal deficits and growth for a panel of 45 developing countries. Based on a consistent treatment of the government budget constraint, it finds evidence of a threshold effect at a level of the deficit around 1.5% of GDP. While there appears to be a growth payoff to reducing deficits to this level, this effect disappears or reverses itself for further fiscal contraction. The magnitude of this payoff, but not its general character, necessarily depends on how changes in the deficit are financed […] and on how the change in the deficit is accommodated elsewhere in the budget. All in all, the past 40 years have been a period of relentless deficit spending policies, that ultimately culminated with the 1970s (8% over the period 1970-1981). Even the Structural Adjustment programs did not do that well; while they did indeed reduce the budget deficit considerably with respect to the spendthrift years of the 70s, the deficit between 1983 and 1992 averaged 6%, while the deficit between 1999 and 2010 was cut in half, close to 2.9%, with two surplus consecutive years. In many respects, Budget deficits in Morocco are not deficit-spending per say. The ‘Rapport du Cinquantenaire‘ correctly pointed out in this graph that investment lags behind current expenditure (pay-wage and stationary, for instant). The deficit has a lot more to do with weak fiscal structure, that prefers to tax easy aggregates (consumption mainly, and it companies are actually the ones collecting the money) instead of taking on special interests (the supplementary report to the Budget bill estimates 33Bn in tax exemptions and breaks are embedded in the 2012 Budget) and broadening the tax base. Ever wonder how much of your taxpayer’s money went to other regions? Of course, if you are from Casablanca, or Agadir, you are entitled to ask if you are from Rabat on the other hand, not so much. Unfortunately however, some budgetary constraints prevent the curious inquirer to get the raw numbers from our administration. And so, I endeavour to crunch these available numbers together to get some idea of how things are computed. Average regional GDP per Capita in these super-regions is 21% higher than nationwide GDP per Capita. In fact, I can even assume that equality is simplified to Y=C+G+I since most of our exports are concentrated on two seaports at the most (Casablanca alone attracts 42% of total export/import shipping ) and use data from the MINEFI paper on regional contributions to GDP, as well as an HCP survey from 2007. It is without much surprise that 5 regions concentrate about 60% of total GDP (Casablanca, Rabat, Marrakech, Tangiers and Souss) and a little less than half of total population. We can also safely assume productivity per capita in these regions is significantly larger, paradoxically because their respective occupation level of active population would be lower. Why would I need the national accounting identity to check which regions rely on government subsidies and transfers? 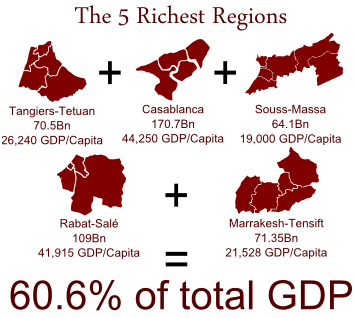 Well, it is a matter of simple economics: a thriving region would not necessarily have a high regional GDP – Soussa Massa has a relatively low GDP per Capita, yet it is one of the richest regions in Morocco (4th richest not including Raba-Salé). What matters really is how their regional GDP is formed; a wealthy, productive region should produce its own consumption and pay relatively high taxes – or at least close to nationwide levels. The following results are based on computations of aggregates per capita: there is a logical enough argument to be made that poorer regions might be over-populated; as it turned out, richer regions tend to have larger populations, they are however more productive, even more so, given the fact their active population is actually smaller, when compared to nationwide occupation rate of active population as well as those of the poorer regions. Per capita results take the demographics out of the equation, and even the odds somewhat. The initial point made about wealthy regions stems from the standard national accounting equation: regional output is (roughly) consumed, taxes or invested. A good point can be made as to how local output matches local consumption, i.e. food and other goods consumed in one region are not necessarily made there; after all, sea-fish consumed in Marrakesh has to come from a coastal city, and Melons down South in Laayun need to come from another, cooler, watery place. Still and all, productive regions are able to produce enough output to buy them their consumption from other regions. Those too poor to afford anything will have to rely on government subsidies, or else reduce their consumption to subsistence levels. 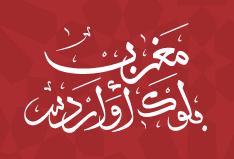 six regions emerge in this case: the Southern provinces, Tadla-Azilal and Taza-Alhuceimas. Their cumulative contribution to total GDP is less than 10%, and their average GDP per capita is roughly that of Souss-Massa. Taxes and Government spending however are a different place; government money levied from or spent on a region stays there. Unfortunately, we do not have the exact amount of government spendings per region, though the other side of the equation is out there: there is evidence about how much each region contributes to total fiscal receipts; As it turns out, the 5 super-regions contribute about 91.5% of 2011 fiscal receipts, about 138.2Bn that is. So the initial body of evidence is there: the richest regions tend to pay more taxes than they produce output, and if Rabat-Salé is excluded from computations, the 4 super-regions account for 74% of fiscal receipts, versus a little less than half of total GDP. In simple arithmetic, every 100 dirhams these 4 regions paid 19.1 of it in taxes, and these were transferred to other regions. The figures at hand are not gross taxes however; these have been netted with subsidies (our Compensation Fund) which makes computations even easier; indeed, national accounting equalities tend to assume perfect funding from taxes to pay for government expenditure. Poorer regions – in this case, the bums are the Southern provinces, Taza-Alhuceimas and Tadla-Azilal would share their output between consumption and government expenditure. This is precisely the case for Taza and Tadla, where Investment per Capita (and at a smaller extent, Net Exports) make up for less than 2% of GDP per Capita. These two regions, by the way, should have received a net 1.5Bn dirhams either as tax cuts, or direct government transfers. But they did not: the local population had to make do. On the other hand, the Southern regions are a riddle when it comes to national accounting; its taxation is a record low, and the assumption behind national accounting does not stand. 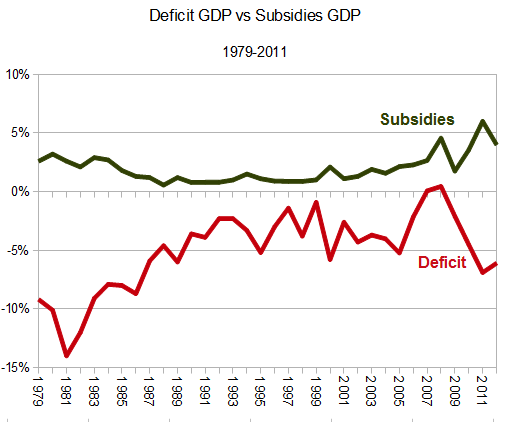 And that is so because the tax aggregate used for that matter was net of subsidies. Think of it as a reversed budget balance: G – T instead of T – G. One additional step would be to propose: where is government subsidies expenditure. The balance is the net government transfer the region benefits from. So what is the score? It is always difficult in view of the numerous shortcomings of proposed methods, but it is clear the remarkably high Southern GDP per capita (30,000 dirhams) which marks these regions as the third richest is solely due to large government transfers, in this case 7.2Bn dirhams in 2011 – .89% of GDP, 17.1% of subsidies dispatched to 3.5% of total population. The bums in this case, those who benefit from government transfers, are the Southern provinces. Regional solidarity is an admirable principle, and should be encouraged at every level of government business. But it assumes transparency in these transfers, and some kind of economic logic to it. In this case, transparency is a vain word – let us not forget the assumptions behind all these computations are very formal, and that means reality might be a lot dimmer, i.e. actual transfers are higher. And the proposed newly redrawn regional boundaries will certainly not help. 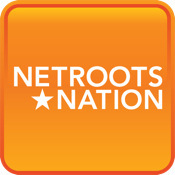 The political ramifications of unequal and unjustified (from an economic point of view, anyway) government transfers from hard-working citizens to others will exacerbate resentment, and there is no doubt unscrupulous politicians will seize upon this if and when an electoral advantage would weigh in. Another way to look at it is instead to push for larger devolution; fiscal autonomy would then show how each region actually does in terms of economic performance, and a dedicated federal fund can then be set up to support those regions with structural difficulties, on the grounds of economic support, not back-room political strategies as it is now.